Generic Effexor XR (Venlor XR capsules) is used for the treatment and prevention of relapse of depression. Generic Effexor XR (Venlafaxine Hydrochloride extended-release capsules) is used to treat major depressive disorder, Generalized Anxiety Disorder (GAD), Social Anxiety Disorder, also known as Social Phobia as well as for the treatment of Panic Disorder. It is also used to prevent relapses of the initial episode of depression or for the prevention of the recurrence of new depressive episodes. Generic Effexor XR capsules are supplied in a blister strip containing 10 capsules. Venlor XR capsules are manufactured by Cipla Ltd. in strengths of 37.5 mg, 75 mg and 150 mg.
At our Online pharmacy, we also have in stock Generic Cymbalta Capsules (Duzela 60mg by Sun Pharma) which is another medicine used to treat the same indications. We supply original Venlor XR capsules manufactured by Cipla Ltd.. The active ingredient present in Venlor XR capsules is Venlafaxine Hydrochloride. Venlor XR capsules contain Venlafaxine Hydrochloride equivalent to 37.5 mg, 75 mg, or 150 mg Venlafaxine respectively. Generic Effexor XR is used to treat major depressive disorder, anxiety, and panic disorder. It is an antidepressant in a group of drugs called selective serotonin and norepinephrine reuptake inhibitors (SSNRIs). This medicine affects chemicals in the brain that may become unbalanced and cause depression. For most patients, the recommended starting dose for Generic Effexor XR is 75 mg/day, administered in a single dose. The recommended dose of Generic Effexor XR (Venlafaxine Hydrochloride) is 75 mg/day, administered in a single dose. The recommended initial dose of Generic Effexor XR is a single dose of 37.5 mg/day for 7 days. Take Venlor XR capsules exactly as prescribed by your doctor. Do not take in larger or smaller amounts or for longer than recommended. Take this medication with a full glass of water. This medicine should be taken with food. Try to take this medicine at the same time each day. Swallow the capsule whole, without crushing or chewing. To make the medication easier to swallow, you may open the this medicine capsule and sprinkle the medicine into a small amount of applesauce. Swallow all of the mixture without chewing, and do not save any for later use. It may take 4 weeks or more for your symptoms to improve. Keep using the medication as directed and tell your doctor if your symptoms do not improve after 4 weeks of treatment. Do not stop using this medicine suddenly, or you could have unpleasant symptoms. Ask your doctor how to avoid these symptoms when you stop using this medicine. Generic Effexor XR (Venlor XR) is contraindicated in patients that have hypersensitivity to Venlafaxine Hydrochloride or any inactive ingredient present in Venlor XR capsules. Simultaneous use with MAOIs is also contraindicated. Generic Effexor XR is also contraindicated in patients aged below 18 years, patients with very high risk of a serious cardiac ventricular arrhythmia, uncontrolled hypertension. Overdose symptoms of Generic Effexor XR (Venlor XR Capsules) may include vomiting, fast heart rate, blurred vision, extreme drowsiness, or seizure (convulsions). You should not take Generic Effexor XR if you are allergic to Venlafaxine HCl, or if you are also using a monoamine oxidase inhibitor (MAOI) such as isocarboxazid (Marpla®), phenelzine (Nardil®), rasagiline (Azilect®), selegiline (Eldepryl®, Emsam®), or tranylcypromine (Parnate®). You must wait at least 14 days after stopping an MAOI before you can take this medicine. After you stop taking Venlor XR, you must wait at least 7 days before you start taking an MAOI. Do not take Generic Effexor XR (Venlor XR capsules) together with the active ingredient desvenlafaxine (Pristiq®). Venlafaxine HCl (Generic Effexor XR Capsules) has been classified by the US FDA as pregnancy category C. This medicine may be harmful to an unborn baby, and may cause problems in a newborn baby if the mother takes the medication late in pregnancy (during the third trimester). Patients must avoid drinking alcohol when undergoing treatment with Venlafaxine XR capsules (Venlor XR) as it can can increase some of the side effects of this medicine. Venlafaxine (Venlor XR capsules) may impair your thinking or reactions. Be careful if you drive or do anything that requires you to be alert. Abrupt discontinuation of any antidepressant including Venlor XR (Generic Venlafaxine) causes withdrawal symptoms. These symptoms can occur following the interruption, dose reduction, or discontinuation of antidepressant drugs, that include selective serotonin re-uptake inhibitors (SSRIs) or serotonin-norepinephrine reuptake inhibitors (SNRIs). The following withdrawal symptoms as listed as "serious" and require immediate medical attention: agitation, anorexia, anxiety, confusion, impaired coordination, diarrhea, dizziness, dry mouth, dysphoric mood, fasciculation, fatigue, headaches, hypomania, insomnia, nausea, nervousness, nightmares, sensory disturbances (including shock-like electrical sensations), somnolence, sweating, tremor, vertigo, and vomiting. Venlafaxine HCl (Venlor XR capsules) should not be discontinued abruptly. The withdrawal symptoms can be prevented or minimized by taking medicine as directed, and when discontinuing, doing so gradually. If Generic Effexor XR (Venlor XR capsules) has been administered for longer than 1 week, the dose should be tapered over 7 to 10 days to prevent a withdrawal syndrome (headache, nausea, dizziness, insomnia, and nervousness). In most cases the withdrawal symptoms are mild, short-lived, and resolve without treatment. You can buy cheap Generic Effexor XR online from Clear Sky Pharmacy. 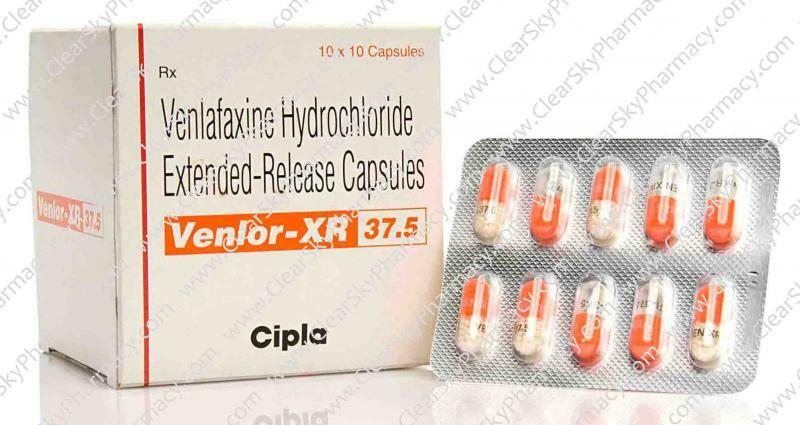 Venlor XR (Venlafaxine Hydrochloride) 37.5 mg, 75 mg and 150 mg, manufactured by Cipla Ltd., India are supplied in a blister strip of 10 capsules. 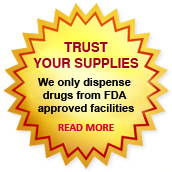 The 37.5 mg capsules cost only $0.30 per unit when you place an order for 200 capsules.